We have looked for the perfect beach house for many years! We finally found it in the summer of 2014. 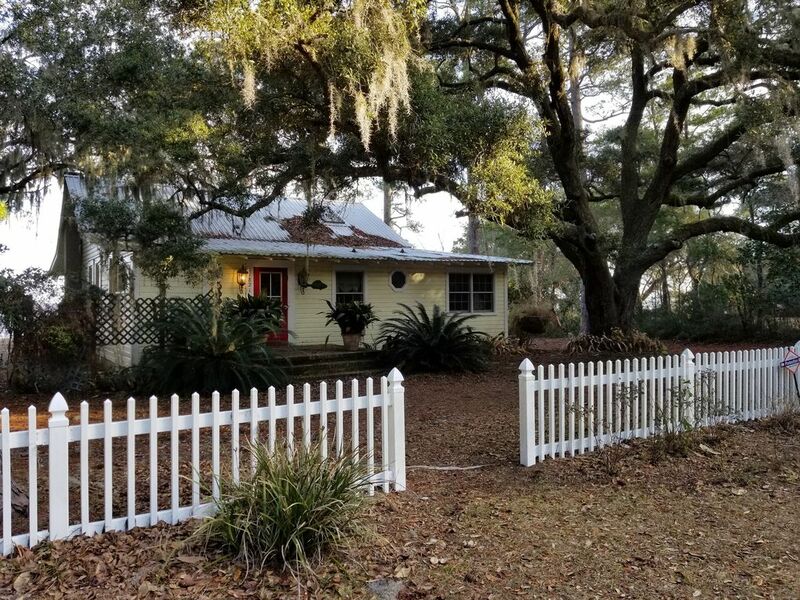 This cottage sits on a secluded 4 acre lot surrounded by live oaks and huge pines! You can enjoy the sunrise and sunsets overlooking Mobile Bay while sitting on your screen porch or out on your private dock. Bringing along a canoe or small boat, you have your own small boat launch from the yard. Our property is a Birder's Heaven. Not only can you sit on the screen porch and watch Great Blue Herons, Osprey and Pelicans fly by and fish for a meal around the dock, but the neotropical migrants are amazing. We enjoy the hummingbirds also! This cottage is one of a kind! The interior is a classic with heart pine floors, walls and ceilings. The cottage has 3 bedrooms, with the master suite having its own bath. The other two bedrooms share a lovely bath. There is a laundry room with washer and dryer. The kitchen includes a full stove and oven, dishwasher, and all the necessary cooking supplies to make it possible to prepare your own meals. Or you may drive just a few miles to enjoy fine cuisine at a number of restaurants at the Beach Club or in Gulf Shores. Mobile Bay is a fisherman's paradise! You can fish off your private dock, catch live crab with one of the traps on site, or put your boat in and enjoy the bay. Mark catches redfish, flounder and specks. If you enjoy the beach side of Ft Morgan, the Mobile St public beach is a short drive (or bicycle) away. I love to walk or run the Pine Beach Trail across highway 180 through Bon Secour National Wildlife Refuge. See photos to see the beauty! If you like to ride bicycles, there is a nice bike trail just down the road that goes all the way into Gulf Shores. The cottage is only about 8 miles from Gulf Shores, close enough to run to town for groceries! Maggie is the Director of Educational Programs at Camp McDowell. She manages the McDowell Environmental Center and Farm School, as well as Magnolia Nature Preschool. Mark recently retired from 26 years as the Executive Director of Camp McDowell, near Jasper, Alabama. He is enjoying retirement but still doing renovation of houses and keeping up our acreage and cabins. Amazing and unique! You'll love it. Such a quiet, private home, while still being so near the beach. We love the quarter mile driveway. 4 acres of peace and quiet on the water. Bird watching paradise. Fish from the dock or put in a canoe and paddle around the bay. Sitting on the huge screen porch watching the dolphin dance and fish...and pelicans and Great Blue Herons fish as well. we provide a few rolls of toilet paper, a paper towel roll, and some dish clothes and towels. The large table seats 6 and a smaller wooden folding table seats 4. There is also a dining counter in the open kitchen with 3 bar height stools. We really enjoyed our quiet retreat at Maggie's Bay Cottage! Bird watching and coffee sipping on the dock each morning was so delightful. We saw a few dolphins as well!! It was a great break! As I was hoping, I got to see the dolphins playing right next to our dock. The house and property was great. I have never stayed anywhere that was stocked as well as this house was. The owner even left spices for our use! Would definitely recommend to anyone! This is my Heart Place! Yep! This is Maggie of Mark and Maggie, who own the Bay Cottage! We got to come down for a few days and enjoy our own beautiful property on the Bay. what a joy! And we had a couple of dear friends join us for a couple days. So love this place! We enjoyed every second of our stay at Maggie's Bay Cottage. The house was beautiful and the view out the back door will take your breath away. We really enjoyed the privacy that the 4 acres afforded us. There are neighbors, but it doesn't feel like it at all.The house had everything we needed for cooking fresh seafood. The owner was very responsive along with the property manager with tips on where to rent kayaks, recommendations for food and quite frankly anything you might need. We have found some VRBO rentals to be a disappointment, but this exceeded all of our expectations. Thank you Maggie! Lovely, quiet place on Bon Secur Bay. Even nicer than the photos show! Old world gulf coast experience! We arrived late so by the time we got our bags in the house and went out to the dock for a look at the bay, our look back at the cottage was deep dusk. What we saw was warm wood and the hug of a home! The change of latitude provided a much needed, and often not appreciated, change of attitude. We look forward to returning soon and often! Thanks so much for the kind words! I love your "warm wood and the hug of a home"! YOu were great guests. -tour Ft Morgan, historical site. -walk the gulf beach at sunset. - walk the gulf beach at sunrise and collect shells. - fish for Redfish and Flounder in the Gulf and in Mobile Bay from the dock, shore or in a boat. - Eat at Tacky Jacks outdoor dining at sunset one night. - Stroll or jog the Pine Beach Trail just across the highway from our Cottage. It goes through the Bon Secour Wildlife Refuge. - sun on the dock or nearby beach.